This is a popular appetizer in USA and very easy to make at home. All cheese lovers will love this dish, but be sure to buy rennet free cheese. Freeze the cheese sticks for 10 min. Mix the All purpose flour, salt, chilli powder and seasonings (if using) with water, to make a thick batter. Cut the cheese sticks into halves and dip the stick in the batter and roll it over the bread crumbs and shallow fry them in the oil. Remove it with a slotted spoon and drain the excess oil on a tissue. Next naan New Jersey varache no bajji... 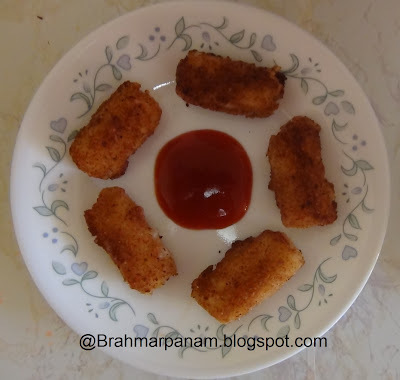 I want all this... Rice Cutlet, Aval Vadai, Mozzarella sticks... looks soooooooooooo appetizing... kalakal!